One of the greatest patrons of tenth century Chola art was Queen Sembiyan Mahadevi. Widowed at a young age, she lived most of her life as a dowager queen. From 941 until her death in 1006, she sponsored the building of numerous stone temples throughout the Cholas’ realm. The bronze workshop that Queen Sembiyan Mahadevi established continued to produce some of the finest iconic images of the Chola period, of which this sculpture is an example. The pattern of the fabric worn by Shiva and Parvati, articulated by bands of circles, triangles and scrolls, is identical to images attributed to Queen Sembiyan Mahadevi’s workshop. In this charming family of Hindu gods, father, mother, and child look out at us with expressive gestures that make them seem alive. The dominant figure is Shiva. He's identified by his tall crown of matted hair. He sits in the relaxed posture of a god. His lower right hand is poised in the gesture of fearlessness. Viewed as a destroyer, Shiva represents the eternal cycles of death and regeneration. The deer in his upper left hand reminds us that Shiva is lord of nature. The slim-waisted woman is Shiva's wife, Uma. She's also known as Parvati or Durga. Both she and Shiva are draped in ornate fabric, decorated with bands of circles, triangles, and a meandering scroll motif—a design thought to be the hallmark of the anonymous bronze master who made this piece. Flanked protectively by his parents is the tiny figure of the naked child-god Skanda. He assumes a dancing position. According to Sanscrit myths, he amused his parents with his antics. His diminutive size, position behind his parents' limbs and the lotus bud he holds suggest that he's not yet reached his status as god of war. But he does retain a certain eminence. Skanda is placed on the same level as his parents, as he is in all images from Tamil Nadu, in southern India. This joyous group was made during the great Chola period of Southern Indian history and art, dating from about 880 to 1270. Look around this room, and you'll see that the harmony, balance, animation, and gentle sensuousness of this sculpture are characteristic of 10th-century Chola-Period bronzes. 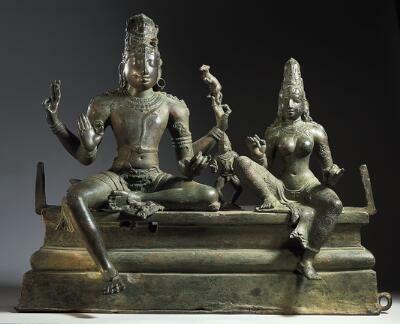 This god is Shiva the destroyer, sitting here with his wife Uma and their son Skanda. Of the three major Hindu gods, Shiva may be the most difficult to understand at first. It’s easy to see how you might worship Brahma the creator, or Vishnu the protector—creation and protection seem like things you’d want to celebrate. But why pray to a god of destruction? Well, the natural cycles of life—day and night, the seasons, birth and death— all depend on two forces working together, creation and destruction. Also, Shiva has the power to destroy negative things. For example, look to your right and you’ll see another statue of Shiva. See him crushing a tiny figure under his foot? He’s stomping out the dwarf of ignorance! This Shiva dances. It’s his way of showing the flow of energy through the world. While we play some music, try to picture what Shiva and his many arms would look like in motion….